This is a letter from the Berry School to Mrs. Weber pertaining to quilts. The school is happy that she is pleased with the quilt. As soon as the Sunshine Cottage reopens in the fall, she will be receiving a larger quilt upon her earlier request. 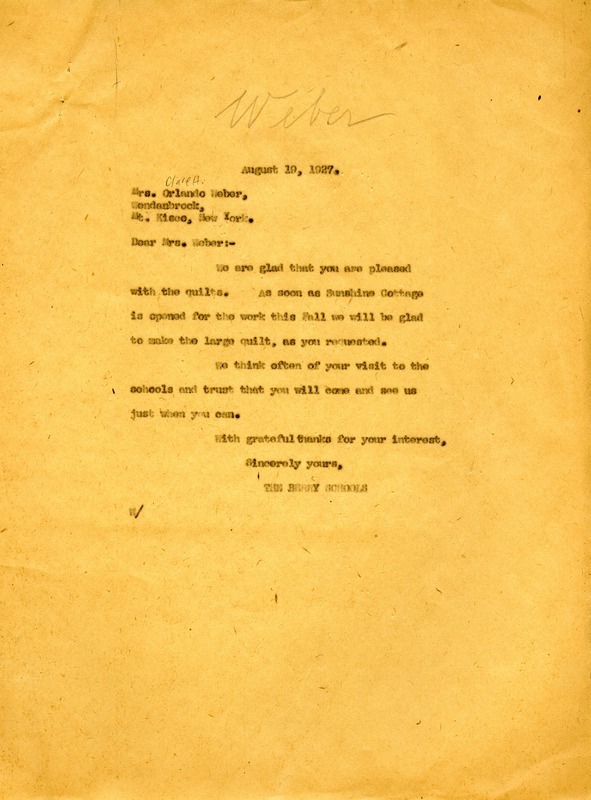 The Berry Schools, “Letter to Clare H. Weber from The Berry Schools.” Martha Berry Digital Archive. Eds. Schlitz, Stephanie A., Sherre Harrington, Clarissa Coffay, et al. Mount Berry: Berry College, 2012. accessed April 25, 2019, https://mbda.berry.edu/items/show/5967.